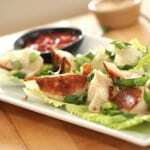 Learn how to make potstickers from Scratch.From how to fold potsticker and how to cook potstickers to how to make an easy potstickers sauce. It’s easier than you think! Prep the napa cabbage by cutting the leafy parts off, leaving the white stems remaining. Chop the white stems into small pieces. Mix the chopped napa with the 1/2 tsp. of salt and let sit in a bowl for 20-30 minutes. This will help remove water from the napa. Combine and mix all the ingredients into a bowl to make the filling. Add a small spoonful of the filling in the center of the potsticker wrapper and wet the edges with a damp finger. Fold and pleat the edges of the wrapper together to make the potsticker. In a nonstick pan add 1 Tbsp. oil then your potstickers then turn the pan on medium- med/high heat. Add 3/4 cup of water, then cover and let steam for 5-6 minutes or until the water has mostly evaporated. Remove the lid, then let the potstickers cook for an additional 2-4 minutes or until the bottoms develop a golden brown crust. Don’t open the potsticker package until ready to use as they will dry out. If needed wrap them in a paper towel after opening to prevent them from drying out. You can freeze the wrappers and defrost them for use later. Completed potstickers can be frozen if not used right away. Just freeze on a tray lined with parchment paper (make sure they are not touching). Once frozen, transfer to a plastic bag or container for easier storage.